Each Tuesday from January through April, and again from October through November, FFC turns our auditorium into a huge play yard for kids birth to kindergarten. From 10am-1pm, the children play, do crafts, ride bikes, play with balls, kitchens, trucks and cars. On average, we host 50 children plus their parents or care givers. Bring a packed lunch for you and the kids and join us! Contact Jan Leonardi at giova1@aol.com for more information! Our nursery from birth to 18 months of age is always happy to care for your babies for both Sunday School & the Sunday service. Our toddler class is open for 18-month to age 3. These classes are also open during Sunday School & the Sunday service. 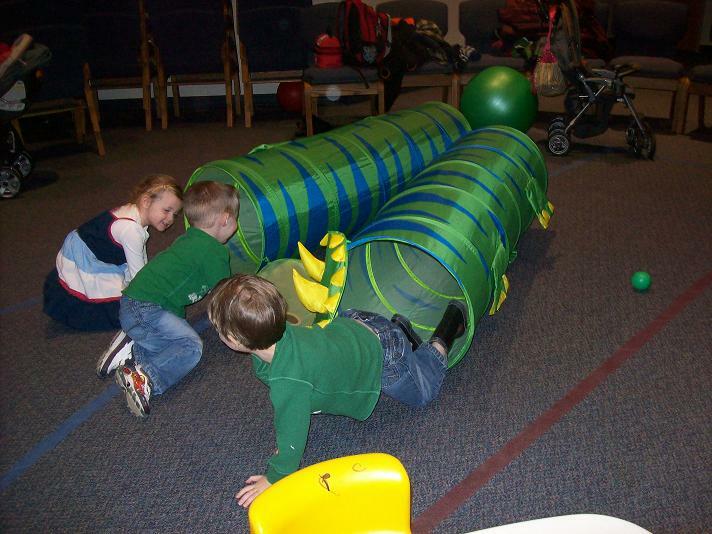 We offer a Pre-K class for kids ages 3-5 during Sunday School and the Sunday service well. In Faith Odyssey (Sunday School), the elementary school children are exploring the miracles of Jesus. the children will learn about John the Baptist and make and eat “locusts.” They will learn about the resurrection of Lazarus, making stained glass windows. In temple, they will play games to discuss miracles that Jesus did. And in science, they will learn about how Jesus turned water into wine. These lessons are a nice introduction to the five-week Easter rotation. Would you be willing to lead a lesson for two weeks? Contact Cheryl Ferguson at wordweavers@fuse.net. Awana Clubs is returning to Faith Fellowship Church starting September 2nd and running from 6:00pm to 7:30pm every Wednesday through the school year. Awana is a weekly program for kids to learn the Bible, grow in their faith, and have a blast doing it! Awana stands for “Approved Workmen Are Not Ashamed,” as taken from 2 Timothy 2:15. Each week, kids from preschool through 5th grade will meet and have lessons, learn verses, and play games. The groups are broken up into Cubbies (preschool), Sparks (K-2), and T&T (3-5). Is it hard to get home and here by 6pm? Don’t worry! We have you covered. We will be offering a weekly meal for you and your kids, so you don’t have to stress over dinner on Wednesdays (donations are accepted). What else do you do at Awana? Throughout the year, we will have lots of other fun things to do. We will have theme nights, Awana store where kids can purchase prizes, and Grand Prix, which is similar to a pinewood derby. We will have pre-registration nights on August 19th and 26th from 6-7pm. You can also register on September 2nd (our first official night), or by contacting the church office. If you have any additional questions, please contact Pastor Josh Taylor at 513-598-6734 x118 or via email at joshtaylor@goffc.org. Toddlers stay in the Toddlers room and Preschool children stay in the rainbow room throughout the service; Kindergarten through 5th grade will be dismissed to children’s church right before the sermon. Elementary children are using the curriculum Grow, Proclaim, Serve. Grow, Proclaim, Serve uses age-appropriate lessons, opening with a visit to Leaper’s Pointe via DVD, where the citizens of this little town illustrate the Bible message. In K–5th children’s church, children will be divided into two age groups to explore the lesson in more detail. Resource Pak materials provide posters, storytelling tools, and games that engage the children with each other and that emphasize faith learning, among other things. Bible Brain Paks for older elementary students provide age-appropriate puzzles to challenge children and help develop the lesson’s relevance to the child. The Grow, Proclaim, Serve website (growproclaimserve.com) offers games for kids, articles that encourage churches and parents, and more. If you have questions about the Grow, Proclaim Serve curriculum, contact Cheryl Ferguson at 598-8109 or wordweavers@fuse.net.